THE SOUL should always stand ajar. I don’t know anything about squirrel spirituality (and who am I to say it doesn’t exist? ), but I think peanut butter could be a portal to squirrel ecstasy. It takes time to make a drawing. There is time for all kinds of things to go through your mind. Some of them are pretty goofy, but that’s part of the fun of it. Just when I think facebook contains nothing but garbage, I get these wonderful blog posts from Lynne Rae. This squirrel is definitely having an ecstatic experience. (and as a lover of peanut butter, I can relate) Although the poem is a bit over my head, the drawing is spot on! Thank you. There should not be a period at the end of the first stanza. Remove it, and the lines read easier: Heaven will not have to wait or depart if our souls remain open to the experience of peanut butter — oops, I mean ecstasy! Love that squirrel!!! Thanks, Pamela, I took out the period. That does help! 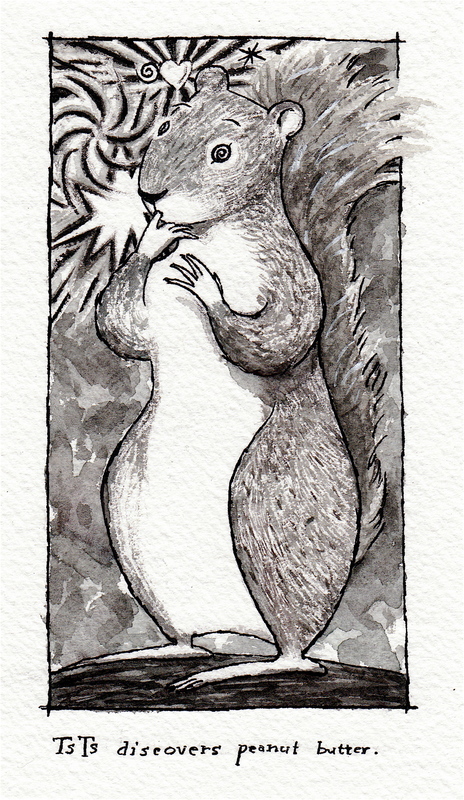 I love your ecstatic squirrel. And I think I’ve seen that look in the eyes of our neighborhood squirrels when we feed them peanut butter. Spot on, Lynne!